This time last week I was having a blast in Stratford Upon Avon with some blogger friends. Had an amazing time, so keep an eye out for my post on it soon!!! Not only did I buy a few older books this week, but I also got sent lots of books to review - Kinda wish I had been sent a few more hours for my days too!! This was one of my bargain buys, sounds really cool! I loved the sound of this, so was thrilled to be sent a copy - currently reading and Loving it! 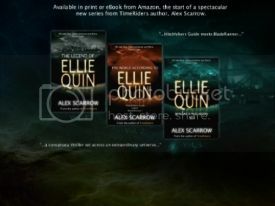 I still haven't got the first book of this series, but intend to get it when I can!! I am SOOOOO Excited for this book! Did a little chair dance when I opened my parcel!!! I've been excited to read this since I heard about it in December, I'm loving the idea of it!! Many Thanks to all the publishers that sent me books this week, You ROCK!!!! Hope you all got lots of bookish treats?? I love the look of When You Were Mine, and Unrest! And I must get around to reading Revolution at some point. I've only heard good things about it :) Happy reading! Graveminder and Revolution looks gorgeous! Rosebush too, I've been meaning to pick that one up for ages! I've read Jane Austen Was My Best Friend by Cora Harrison, so Jane Austen Stole My Boyfriend shall be fun! I'm not even going to go into my jealousy of you having When You Were Mine and Unrest. LOL. Enjoy!! You got some amazing books this week! I'm really excited to read Welcome, Caller. It seems like a fun read! Nice mailbox this week! You're entire list is all new to me. I will have to look them up and see what these books are about. Great mailbox! I love Sherrilyn Kenyon! I hope you enjoy them all! Wow! It looks like you got loads of books, well done! Great ones too :) I've got Graveminder on my wishlist (I might get it for my birthday in a couple of months or so) and I've got Book Of Summers here to review too. Oh my god I LOVE REVOLUTION. That book is beautifully written, painful, breathtaking, romantic, it is ALL OF THE THINGS. Also? I totally LOVE that cover of After The Soon. I just like birds, I guess. Great set! Yay for Revolution. I love that cover. It was one of my fav reads last year. I can't wait to read 'Torn' looks good. I really enjoyed Graveminder, I hope you do as well. Wow! Great haul. I received Welcome, Caller last week. I just haven't got to it yet. Great haul! Rosebush I really liked, big fun of the Blue Blood series and haven't yet read Jennifer Donnelly but I really want to! Now that's a LOT of books you have here. I am particularly taken by After the Snow though and Graveminder. The key in Revolution also looks very intriguing. Have fun with your new reads this week!